Last few days we were experimenting around voting concept for Mythic+ Keystone Dungeons. We opened different ways for players to vote for teammates to show how much they appreciate them. Many of you wondered about this new feature and asked us how does it work. And now we are ready to tell. Please take a look at our current version of Mythic+ Karma and read below the description. 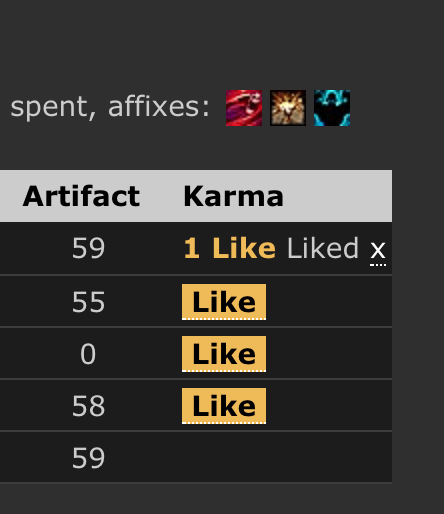 Mythic+ Karma is a cumulative value from all Mythic+ runs votes, or "Likes" in current version. - Only players participated in the run can like each other. - It is possible to like the same player many times: for each run you did together. - Mythic+ Karma depends on Dungeon Level, just as Mythic+ Score. Highest levels likes aren't diminished, so it is always worth to re-like highest level runs! - The best way to acquire more Karma is to run with many different people, on highest level and get them to like you! - There are no negative votes, only likes! - It is possible we will rework Karma calculation in future, so the standings might be changed. - You are able to unlike by pressing "x". - Only runs from last 14 days can be liked or unliked. - Likes will be not anonymous! Soon you will be able to show who liked who. M+ Karma is for people who enjoy receiving likes from their teammates, it is not supposed to be a tool for deciding who you would want to accept in your M+ group.